I get the feeling that although I'm seen by many as a Social media Darling (you know who you are) I'm a rubbish Blogger. I don't say how I feel in the right forums and when I do it isn't nearly often enough!. Today I shall change that (well try anyway). First off here is something about myself! I'm 21 and from rainy old Scotland I love playing basketball and swimming! and Love Asian cinema (live action). For many years I've been interested in music and despite having little talent to make it. I decided I wanted to be on the radio ( well I have the right face for it), for years I was working in jobs with long hours and low pay and when I did get a chance on a local station the people running it were there less than us so that was a fail. Finally I'm on the right path at a great college and under the wing a of fantastic radio Producer. 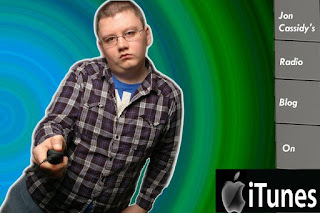 I have developed my own podcast series on iTunes (when I can get guests booked) along with my own brand Jon Cassidy's Radio Blog which is also on Facebook and YouTube as well as my own Twitter feed. I have all the tools at my disposal I just need to use them. Yes I do have a Google+ but I don't see the point in it yet. Do you remember MySpace? well I haven't deleted mine yet but haven't updated it in ages either (figure that one). My opinion is that it's the end of the road for the old boy anyway!. I'm becoming a bit of a tech geek especially social media and constantly check on the best stories of the day but this blog is not actually about me no it's about you it's about you and what you think on social media, music, radio and technology! so don't be afraid to comment or post and make this the best community possible!